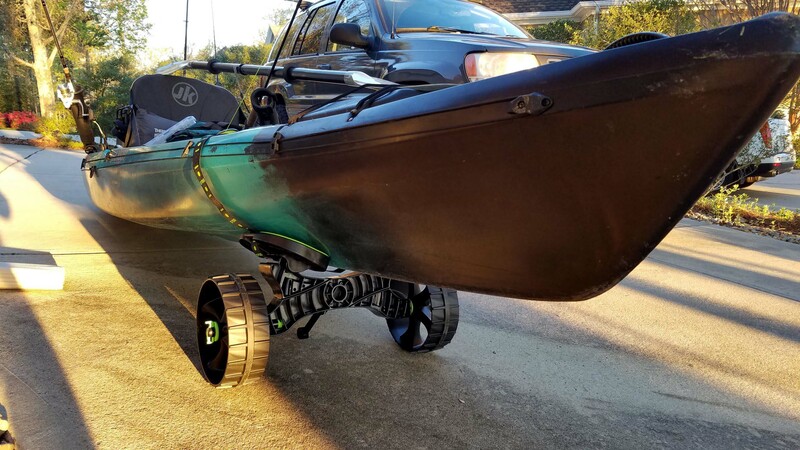 C-TUG makes one of the higher end kayak carts available and their design is definitely different than the normal metal tube frame with rubber tires found on most carts. The neon green pads and slick black frame really makes it stand out and it just looks like a solid cart all around. I had the chance to run this cart down some rocks, steps, and slopes with a 13′ kayak. Check out how it performed! When I first unboxed the kayak trolley I noticed two things right off the bat that I wanted to make everyone aware of. First, from viewing the kayak cart online the wheels online appear to be made entirely of plastic, but in fact they have a thick rubber tread molded into the tire, which is awesome as that was one thing I was apprehensive about. 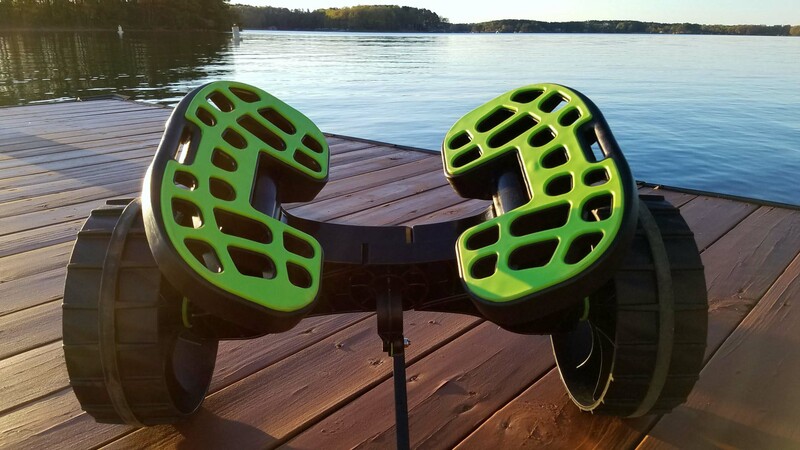 The cart doesn’t slip at all on wet docks, and the tread helps give it traction. Secondly the cart comes in pieces that you have to put together. What this means is that you can also break it down and store it in your kayak hatch – this is nothing short of brilliant! One of the primary reasons I don’t typically use kayak carts is because there is no place to store them when you get to the water. If you have a long walk to launch your kayak you aren’t going to turn around and walk the cart back to the truck, leaving your kayak and expensive fishing gear unattended. Your only option would be to either hide it in a bush and hope no one steals it, or put it in the kayak which takes up valuable space most likely already reserved for a cooler and rods. In all the assembly of the cart only took a couple minutes and is it very easy now that I know how to put it together. This was the path to my kayak launch. 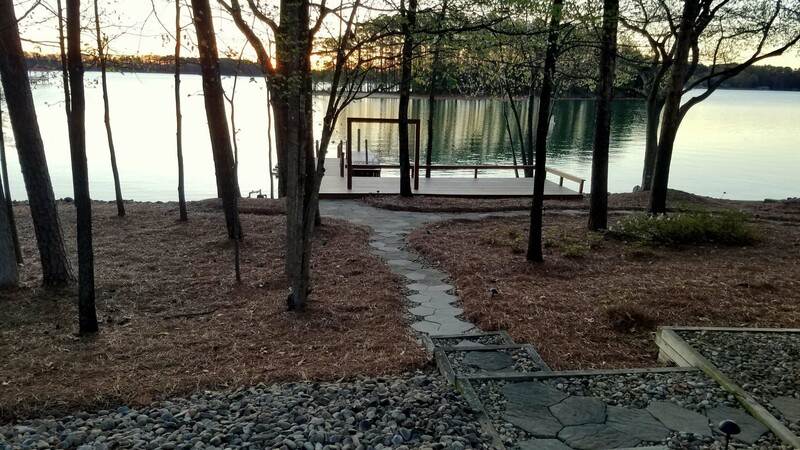 It consisted of ten total steps as well as a sloped dock ramp and stone paver path. Putting the kickstand to good use. The kickstand holds the cart upright so you can load the kayak onto it yourself. It’s not intended to support the weight of the kayak. The pads are also adjustable to fit the angle of your kayak and grab on. I opted to put the cart toward the front of the kayak and lift and steer from the back. 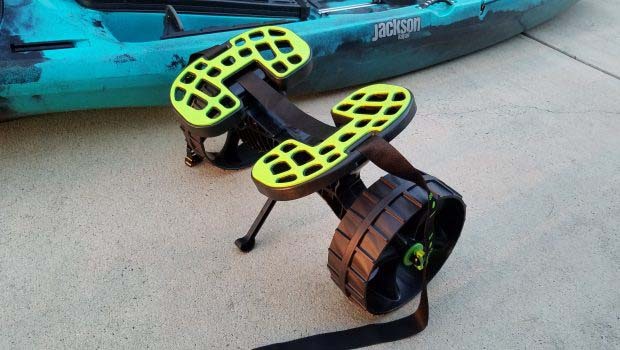 This worked very well for me, but I also think you could move it to the middle or rear depending on how you want to transport your kayak. I got ambitious and decided to test out the ability of the cart on a sloped rough rock hill. It actually did pretty well until the end when the kayak rolled off. In hindsight I should have strapped it down, it was a rough ride. This may have been better suited for the aftermarket Sandtrakz wheels to help absorb the impact of the rocks. I made it to the launch point at the end of the dock. Prior to this I used to just carry the kayak. The cart made a huge difference and let me take just a single trip with all my gear already loaded up in my boat. Sometimes the features list of a product really hype it up much more than it should be. So I decided to breakdown the claims to see how it stacked up against my experience with the actual product. I felt this was all true except for the ‘all terrain’ part as the cart comes stock. Rocky lake shores or soft sand would be hard to navigate with the wheels currently on this cart. Fortunately C-TUG makes Sandtrakz wheels which are built to compress, giving them a longer track and helping maneuver in soft sand and take the brunt of a larger obstacle. These would have been awesome for dropping down the steps. Dismantles in under 20 seconds – This sounded like a challenge. I was able to dismantle the pads and wheels in 3.5 seconds which is all you need to do to fit it in my kayak hatch. Fits inside kayak hatch fully dissembled – Yes this is true as long as you have a hatch with a diameter large enough for the wheel to fit in. Tool-free assembly – This is a big deal. It is super easy to assembly and dissemble on the fly. Puncture-free wheels with hi-grip rubber tread – I like that the wheels are puncture free and the tread feels high quality. Light weight 10 lbs and easy to handle – Agreed. 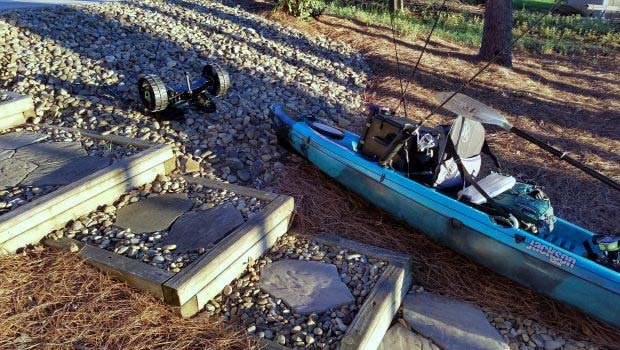 300 lbs static loading – Does anyone own a 300lb kayak? I guess this means you can load a person in the kayak and cart them around. Reinforced composite material – No reason to think otherwise. Thermo-bonded elastomeric hull pads – Yes elastomeric is actually a real word, I had to look it up. It basically just means rubber. Stainless steel reinforced axles – I couldn’t find evidence of this, I suspect that the reinforcement is inside the plastic of the wheel or axle. 7.5 foot strap with cam-lock buckle – I did not like this buckle. It was hard to assemble and kind of bulky. I used an aftermarket kayak strap instead. Adjustable kick-stand – The kick stand is great when you’re trying to get the kayak onto the cart yourself, however you want to be sure to put the kick stand facing backwards so once you start moving it will not pole vault your kayak off the cart. I thought this cart was going to be pretty good when I saw it, but I was wrong…it was phenomenal! C-TUG has created a unique kayak cart that includes a lot of really cool features in the design. This cart is clearly built by kayakers. 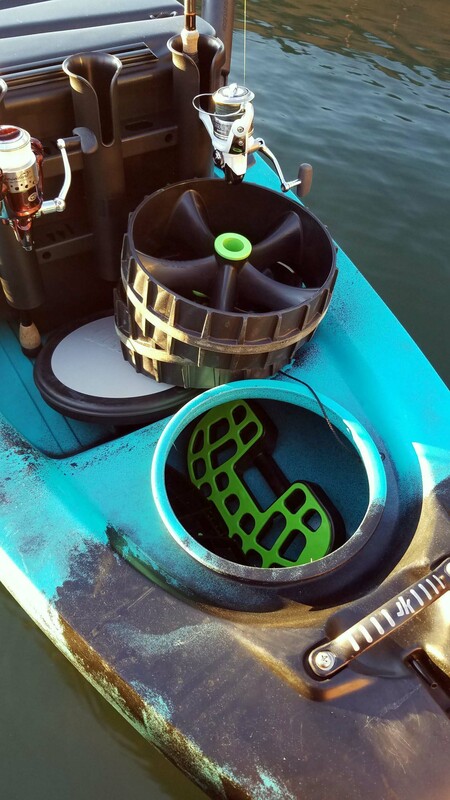 When it comes to kayak carts there is not a single solution for all terrain, which is something C-TUG addresses with the aftermarket sand wheels. 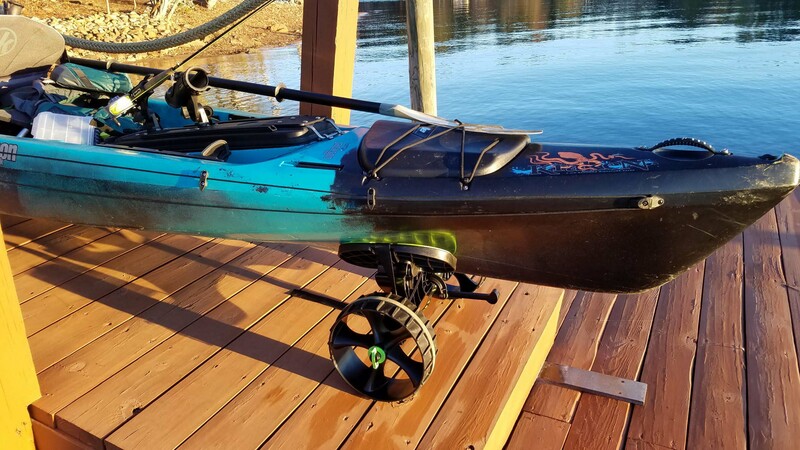 Overall I wouldn’t hesitate to buy this kayak cart and I highly recommend it to other anglers based on the following; it’s strong, it rolls and grips well, and it is easily taken apart to store in your kayak hatch. I went on an inshore fishing trip this past weekend with several friends where we camped on the water, but had about a 150yd walk to the boat ramp with our kayaks each time we wanted to put in and go fishing. This kayak cart got pounded with three kayaks both ways across uneven grass, mulch, and boat ramp grooved pavement every time we went out. Needless to say it was put through it’s paces and it came out on top. Not only it did transport my 76lb kayak with 78lbs of gear (154lbs total), it saved us a ton of hassle of having to carry kayaks back to the campsite after hours of paddling and fishing. I was suitably impressed that it held up to so much and I still love that it can break down into pieces (I only have to remove the wheels and pads) to store it in my kayak while paddling. Still a great cart!